Selected in the second round (17th overall) of the 2018 CFL draft and signed on May 14, 2018. 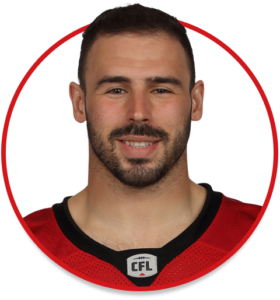 (Calgary) Mezzalira appeared in 14 regular-season games during his rookie season and recorded five special-teams tackles. He made his CFL debut in Week 1 against Hamilton and had three special-teams tackles in Week 8 against BC. Mezzalira played in Calgary’s two post-season games and had a special-teams tackle in both the Western Final and the Grey Cup. Mezzalira played 28 games over four seasons (2014-17) at McMaster and accumulated 95.5 total tackles including 8.5 tackles for loss, two sacks, three fumble recoveries, one forced fumble and two pass breakups. In 2017, he led the Marauders with 43 tackles and had five tackles for loss. Mezzalira starred at Cardinal Newman Secondary School in Stoney Creek, Ont.